September 18, 2018 / Valerie Wilson Travel, Inc. When it opened in 1912, the Ritz-Carlton Montreal was recognized as one of the city's most esteemed five-star hotels. Today, more than 100 years later, the Grande Dame of Sherbrooke Street still sets the standard among luxury hotels in downtown Montreal, blending historic splendor with contemporary design and earning the prestigious AAA Five Diamond award year-after-year. The Royal Suite, also known as the Suite Grimaldi, has a long tradition of welcoming the highest dignitaries and powerful people. Many leading figures of the 20th century have stayed at the Ritz-Carlton Montreal, including Queen Elizabeth II, Winston Churchill, Charles de Gaulle, Richard Nixon, Pierre Eliott Trudeau, Brian Mulroney, George Bush Sr. and his Serene Highness Prince of Monaco, Albert II and Charlène. Our Royal Suite is the largest hotel suite in Montreal with its 4,700-sq. ft. The 3-bedroom suite can also be configured as a 1-bedroom suite, part of the architect’s intentions to divide public and private spaces. A master and junior bathroom off the master suite, as well as a private sitting area and library are just some of the luxuries that await guests who check into the Royal Suite. The hotel’s splendid history is recalled through the suite’s décor, which features a $75,000 reclaimed desk from the original building as well as unique curved windows. Is there a famous name, a particular street or monument that you most identify with? What inspired your style? It would be Monaco’s Princely Couple, his Serene Highness Albert II and Charlène. They were the Royal Suite’s first guests after the renovation and they even gave us the honor to inaugurate it. Therefore, we call it the Suite Grimaldi. Between 2008 and 2012, the Ritz-Carlton Montreal underwent a 200-million-dollar renovation. 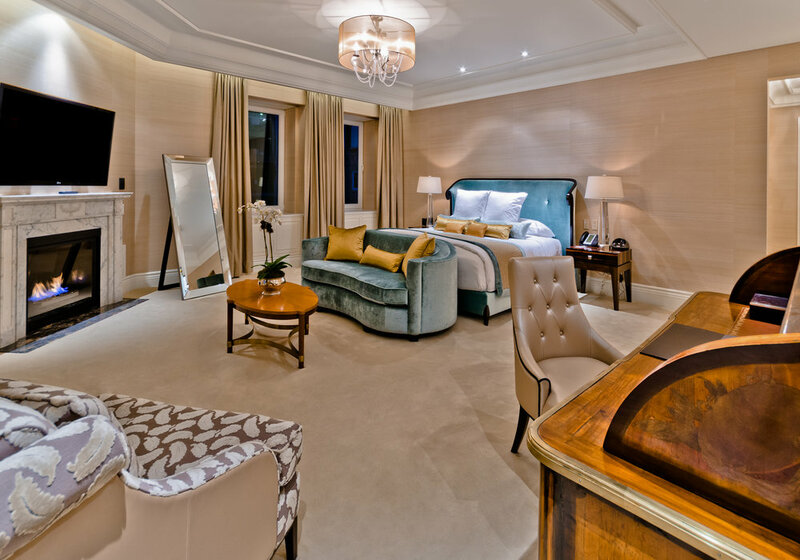 The Royal Suite was completely refurbished. We kept the old charm that made our Suite famous and modernized it to comply with our guests’ expectations in regard to security, comfort, new technologies… We really put ourselves in the Royal Suite’s powerful guests’ place and tried to think of everything they would need when staying with us. We found comprehensive solutions to please them and to make sure they always have a delightful and safe stay with us. What would be your advice for a first-time guest visiting? Advice for a first-time guest visiting would be to have an Afternoon Tea in our magnificent Palm Court. The Afternoon Tea is the oldest tradition of the hotel. It started in 1913 and we have been continuing this tradition ever since. How would you like to be remembered? The most important for us is for our guests to feel at home far away from home. We want our guests to remember their stay through the comfort of our room but more importantly through our Ladies and Gentlemen’s dedication to make each stay a long-lasting memory. Most of the guests staying in the Royal Suite are head of state and powerful people. They travel a lot and are often far away from home. We constantly need to make sure we provide them with the most customized and discreet service. Who was your all-time favorite guest? We love all our guests. It wouldn’t be possible for us to name the best guest we welcomed. Situated at the social center of high-class culture in Montréal, the Ritz-Carlton is a beacon of refinement that elegantly attracts the discerning tastes of celebrities, business travelers, notable heads of state, families, couples and artists. Click here to learn more about Ritz-Carlton Montreal and the Valerie Wilson Travel Suite Access™ benefits available to you.